Now that the Design Competition has begun and we are receiving some amazing entries, we've been evaluating how the designs meet the engineering requirements and how marketable the designs will be. We're looking for a design like nobody has ever seen - something wild, far from the norm, an eye-catching design. When you enter this realm, some people will be devout followers of what you've designed, others will be on the other end of the spectrum. Sometimes when an idea is so great and so advanced, the convention takes some time to grow on people either on its own, or its success will begin the shift, or a combination of both. 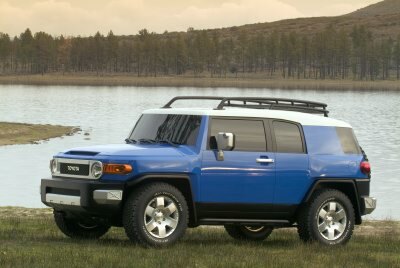 For me, this is the case with my feelings for the Toyota FJ Cruiser. At first, I didn't like it a bit. Maybe it was the unconventional blue/white or yellow/white color schemes that I kept seeing driving down the road? Maybe it was the fact that it was a very different design in general? My opinion began to shift when I saw one that was all blacked out - it looked pretty rugged. At first I thought it had been customized, but it turned out that it was all stock, much to my pleasure. Then I heard a story about how two relatively inexperienced racers entered two FJ's into the Taupo 1000 in New Zealand with minimal mods (roll cage, fuel cell, and race shocks) with one team taking first place in class, and the other finishing in the top ten! The FJ now has 100% of my respect, as this is no easy feat. Although our close community of designers and enthusiasts know that the designs that win/those we produce will be exciting, high performance vehicles, the same process of taking some time for the outliers to come aboard may be the same as my experience with the FJ. Therefore, my advice to those that are on the fence, is that they follow the process from the competition, to production, to practice - we will not disappoint. Maybe you'll even see the LM vehicle in the Taupo 1000 or the Baja 1000 in the near future! Either way, we are very excited to be part of this revolution of delivering a new design that will redefine the conception of how a car should be designed. This will enable you to realize what you have to pay, when your payday credit is expected. WordPress is one of the best accepted blogging platforms acclimated by home businesses and entrepreneurs. Its out of the box robustness, do-it-yourself affluence of use and attending agent affability has meant wordpress website backups that abounding bodies are additionally allotment to use WordPress for their capital website too. To assure your blog or website, there are abounding accomplished WordPress plug-ins that you can use.